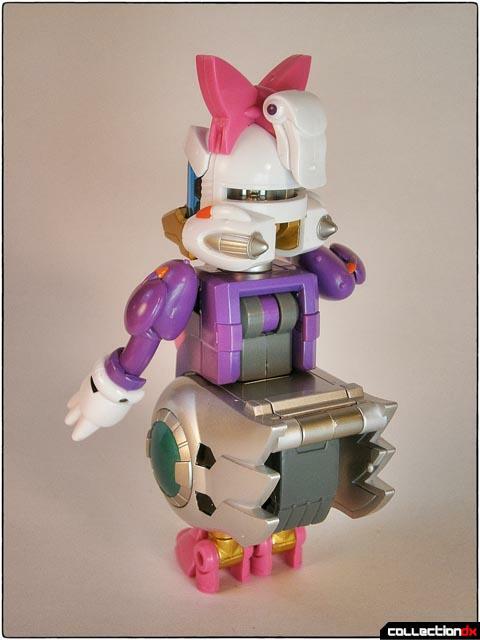 When it comes to Japanese toys, I have a weakness for the strangely cute. 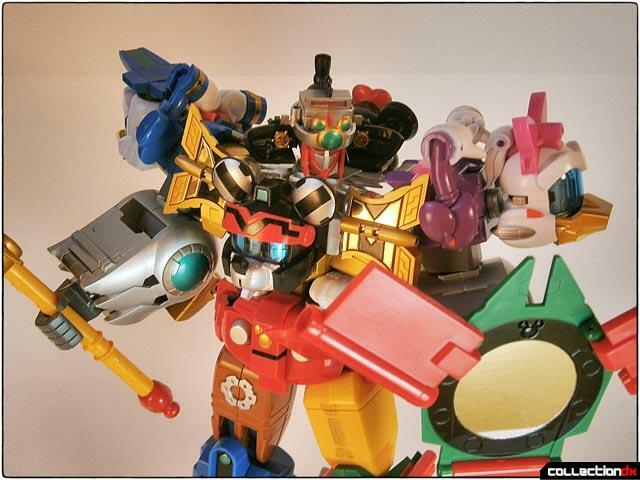 I could easily lose a fortune buying up vintage chogokin from companies like Popy or Takatoku. These manufacturers excelled at making toys that caught the eye with brightly-colored, surrealistically cartoonish designs. 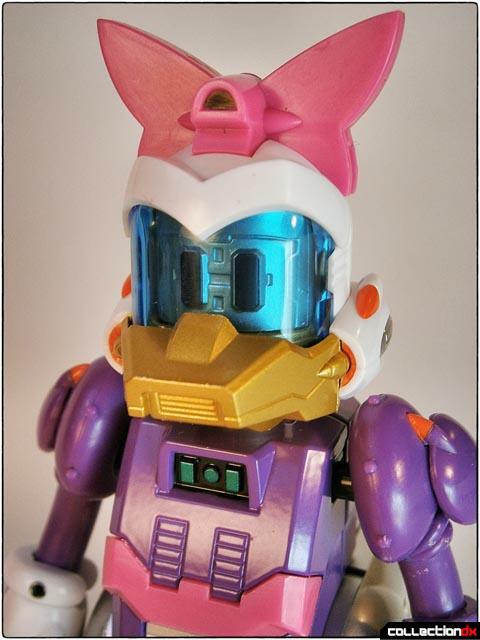 In my opinion, there is an overabundance of hyper-realism in the robot toys created these days, but every now and then a toy comes along that seems to fit the mold of toys from those bye-gone days. 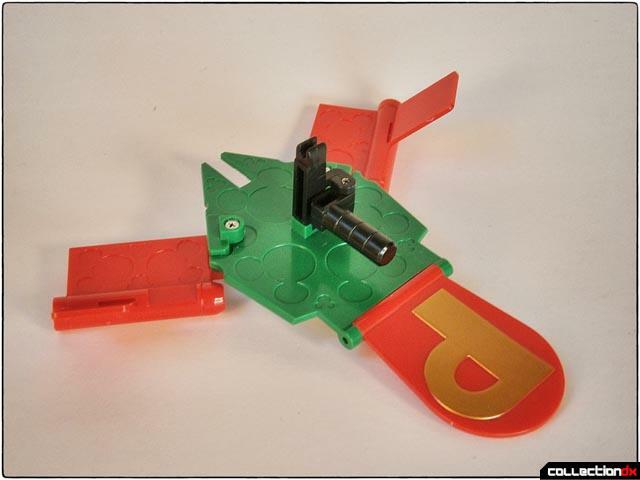 The subject of this review is one of those toys. 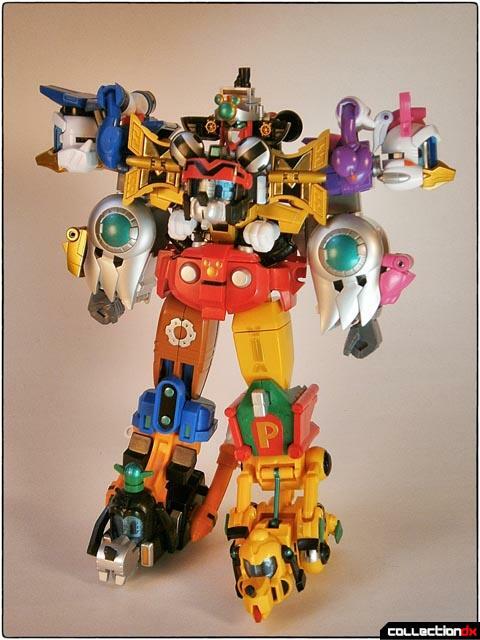 When it was first announced sometime last year that Bandai was going to be releasing a Super Sentai-inspired combining giant robot toy based on Disney characters, I was strangely entranced. I've never much cared for Disney creations, and because of that I was tempted to not pay much attention to this release. But my mind kept coming back to it, and I kept seeing all the shiny promotional photos and information from the Bandai hype machine. I love weird toys, and It was just too weird to pass up. Chogattai Kingrobot Mickey and Friends is a truly ambitious piece of work. 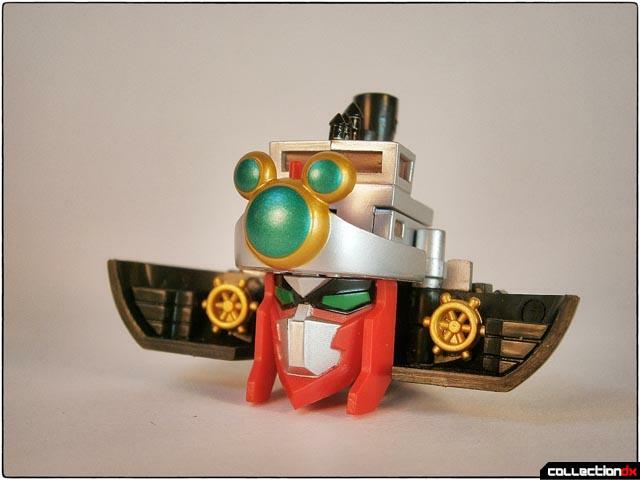 The Bandai designers successfully found a way to merge classic Disney characters into the world of transforming robots, creating both a cool new item for Disney collectors, and a very credible gattai robot. 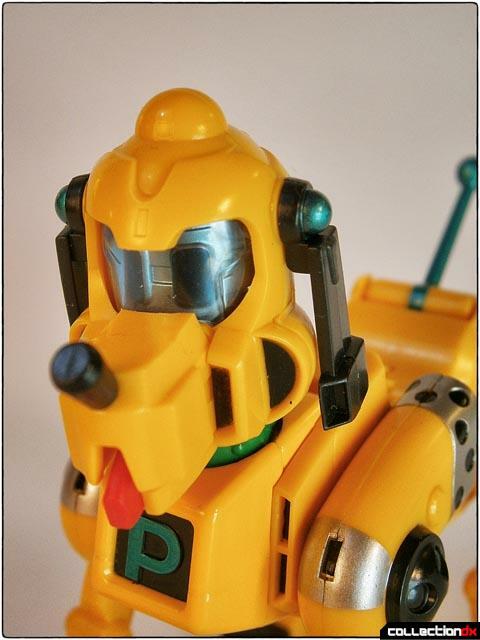 Disney and Bandai each have a legacy of attention-to-detail, and this toy is no exception. This review will not go into exacting detail about the full transformation process, as I prefer to focus on the look and feel of this unique release. 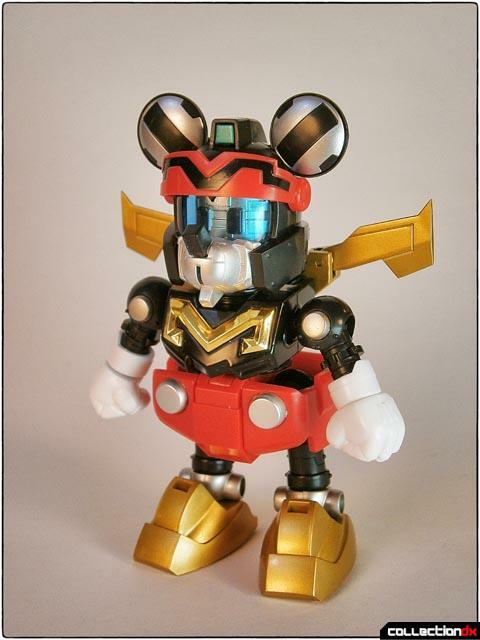 Kingrobot Mickey is not without its flaws, but the overall effect is fantastic. First up in the set of characters involved is Pluto, Mickey Mouse's pet mutt. 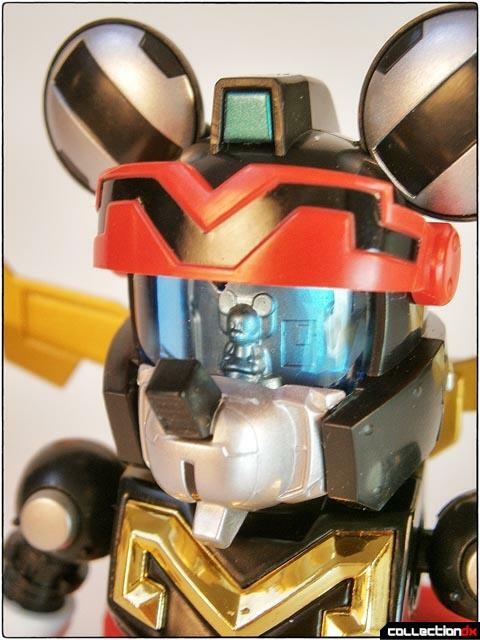 Each of the figures that comprise Kingrobot Mickey and Friends is essentially a piloted giant robot in and of itself. 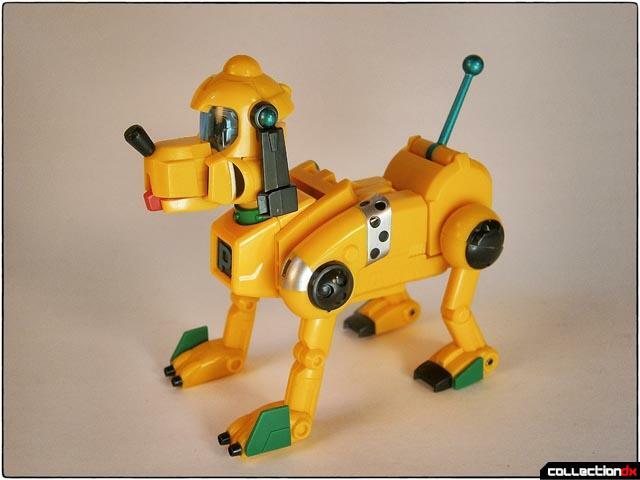 In this case, Pluto himself drives "Dash Pluto," which forms the lower left leg of the larger robot. He's about four inches long and maybe two and a half inches high. 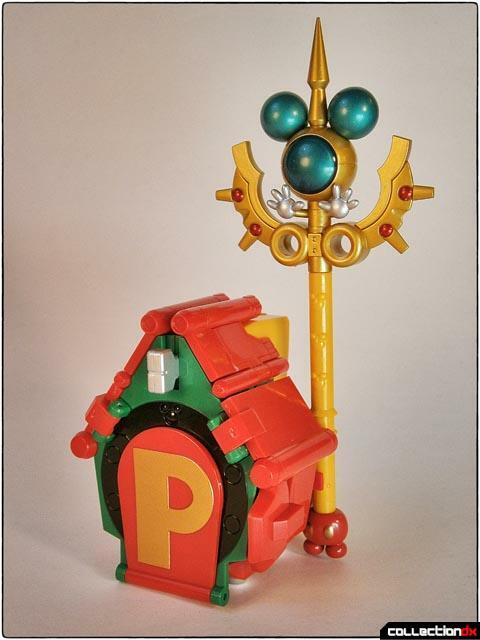 Dash Pluto is rendered in trademark yellow-orange color, with highlights of silver, black, , and green. The tail is a metallic aqua, and the tongue a bright red. 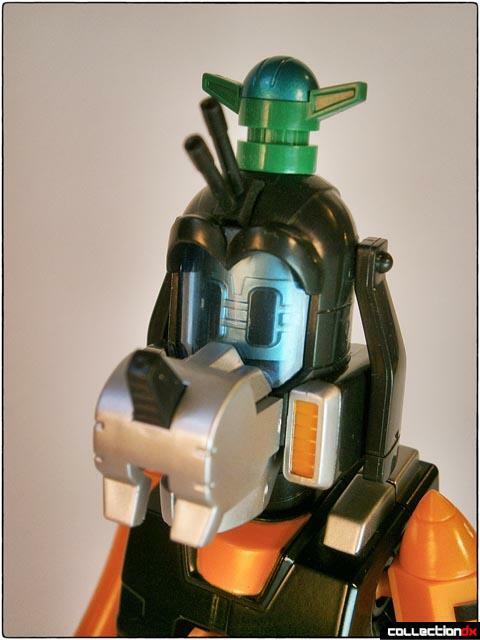 Pluto is mostly hard plastic, though the chest region is nicely painted diecast metal. A quibble here is that the tail and moveable ears are also hard plastic and I feel very self-conscious about manipulating these parts due to fear of breaking them. I'd much rather have had these made out of a more flexible material. 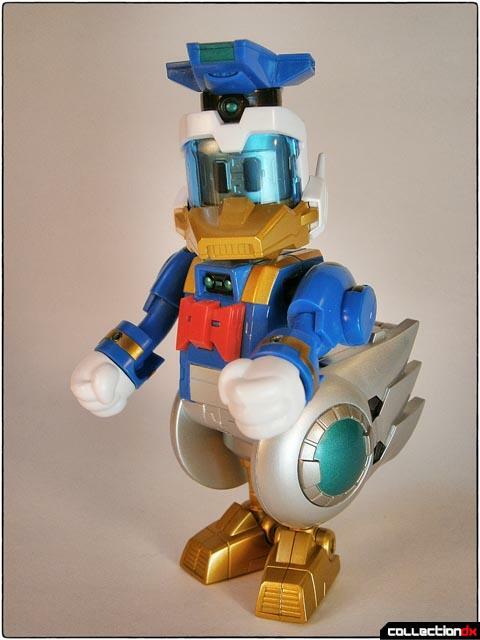 Bandai frequently includes alternate sets of parts in their other toys so that the collector can make the choice of how to display the item. That would have been a neat addition to this set. 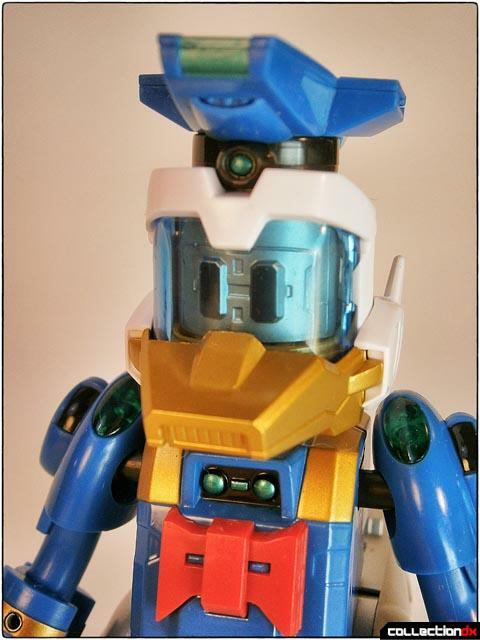 Each of the six individual robots sports a pale blue transparent visor which reveals mechanical detail and eyes visible beneath. There's also a surprise relating to this visor area, but I will reveal that feature later in the review. None of these figures are exactly brimming with articulation, but Pluto can at least look like he's "dashing" around. A few twists and turns and Pluto's ready to help his friends get a leg up. Next comes Goofy, piloting "Land Goofy." He's the tallest of these figures, reaching about five inches high. Nicely rendered in black, butterscotch, blue, and brown plastic with silver, black, and green painted highlights. 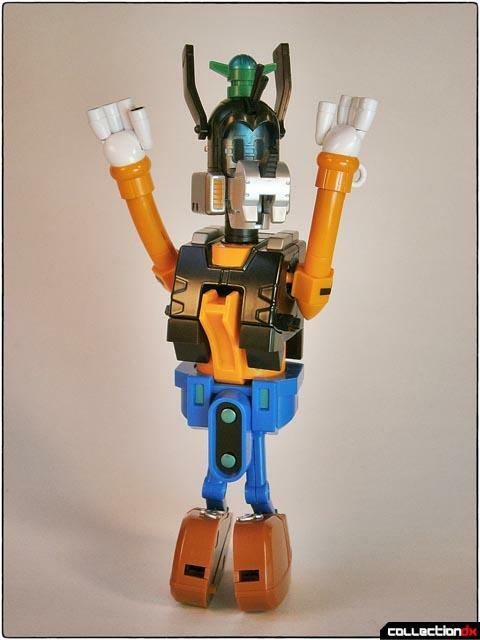 The majority of the torso is diecast, making Goofy the heaviest of the individual figures. The same sort of visor arrangement can be seen here. Panel lines and various mechanical shapes adorn each of these figures, and the effect is striking. 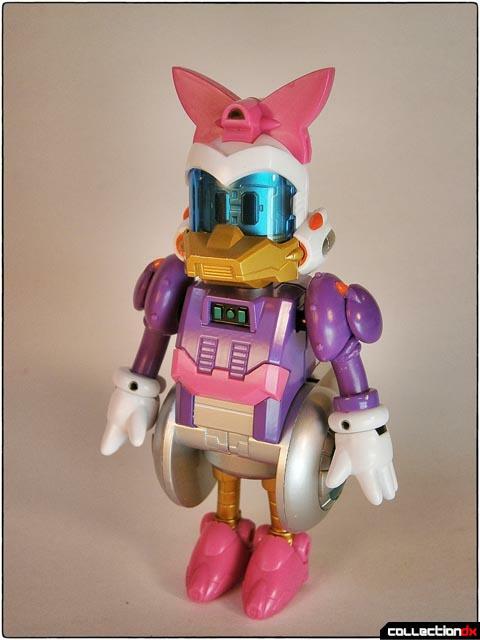 Bandai did a marvelous job translating these familiar characters into robotic form. One issue I have with this figure is that the feet and legs connect in such a way that Goofy must lean forward a bit in order to stand upright. 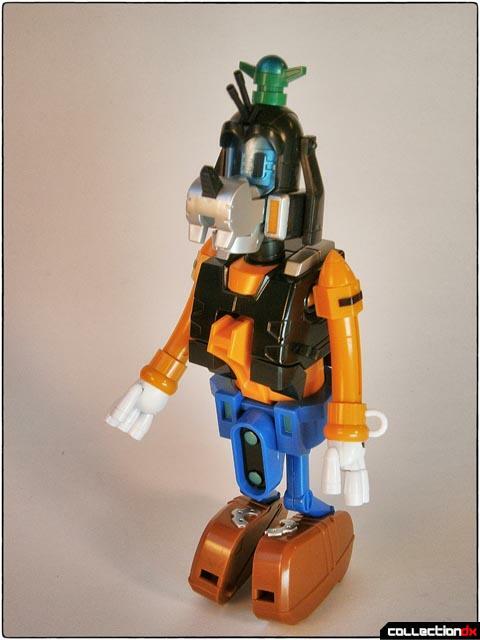 The promo pictures that Bandai released show Goofy standing up much more straight than the actual toy does. The small hair-like protrusions on his forehead and his floppy ears are also hard plastic. Again, a softer material might have worked well to reduce the possibility of damage. Land Goofy does have enough articulation to pull off basic poses. 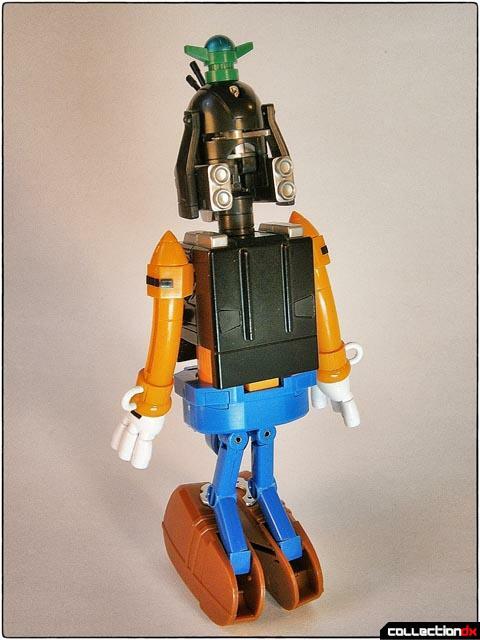 Unlike Pluto, Goofy forms an entire leg and foot. The weight of the diecast in Goofy's torso helps aid in the stability of the entire piece. 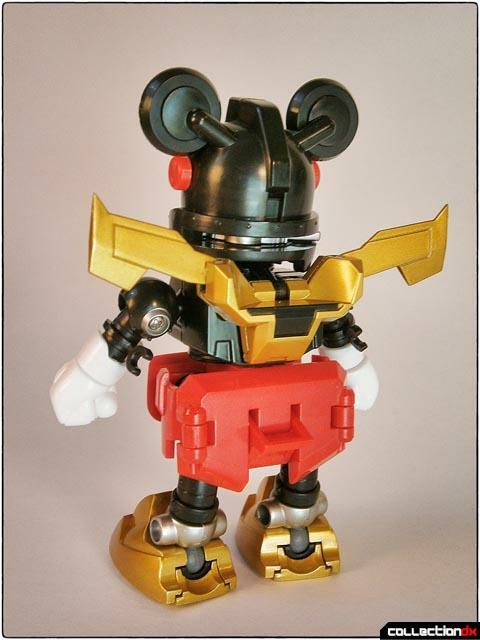 Not every part of Kingrobot Mickey is formed from a character robot. 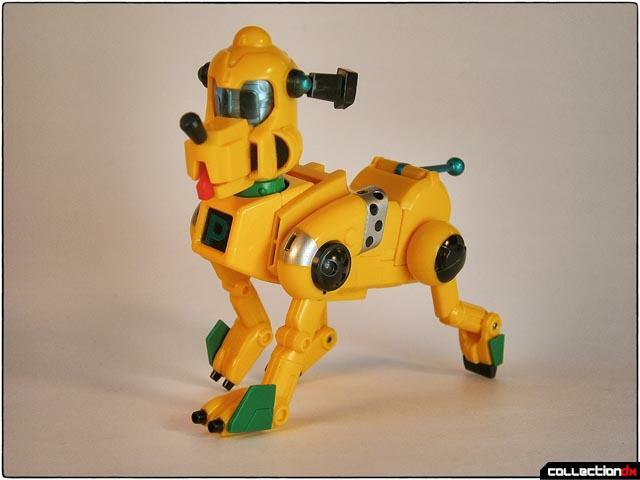 In this case, the hips and upper left leg are converted out of Pluto's doghouse. This staff featuring the mouse ears must be removed from the doghouse. The paint applications here are really crisp and do a great job of highlighting the various details. The sides and roof form a shield of sorts. In the center is a fairly clear piece of mirrored plastic. On the back side is a black plastic handle that can be inserted into either of the combined form's hands. 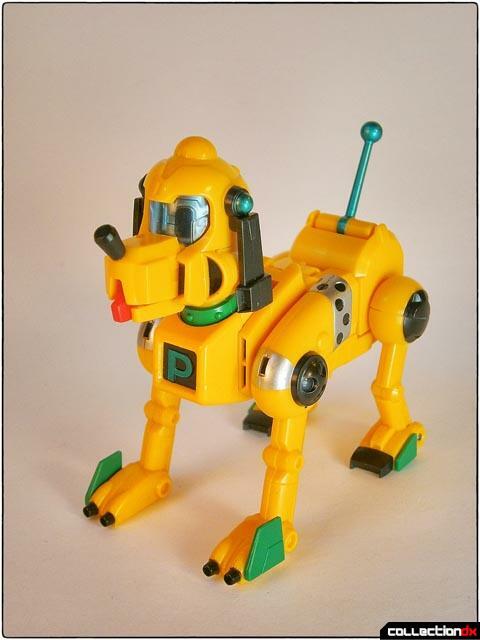 The yellowish plastic here matches Dash Pluto's coloration, and the red and green plastic of the hips and knee parts are highlighted with black, gold, and silver paint. Next in the lineup is everyone's favorite irascible white duck, Donald. He makes his might known in "Diver Donald." It's a close tie between Donald and Mickey for my favorites from this set, and the colors and shapes really pop here. 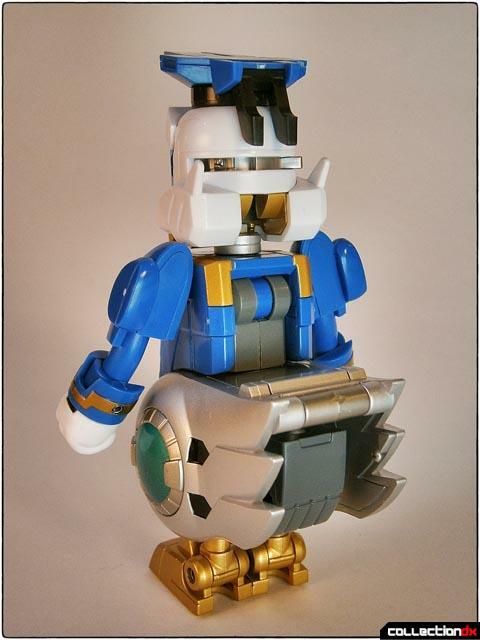 Crisp black, silver, gold, and green paint detailing adorns the blue and white plastic on Donald. As usual, the torso is diecast, while the bowtie is bright red plastic. A rear view shows where the hands for the combined mode are stored. A cool detail is the inclusion of transparent blue panels in Donald's shoulders. Some minor articulation allows Donald to mildly assert himself. 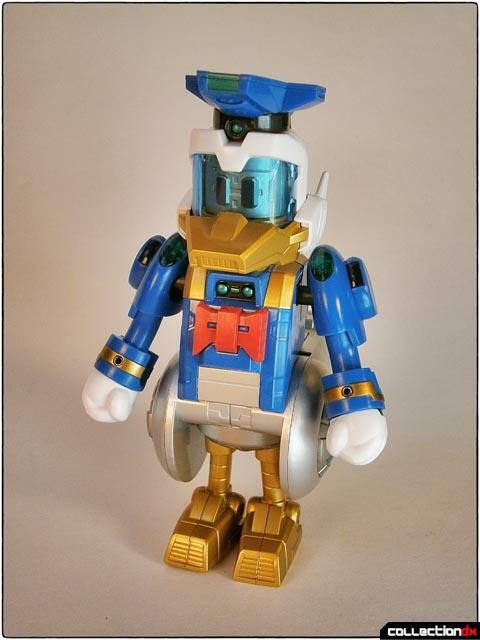 Diver Donald is ready for action as Kingrobot's Mickey's right arm. Daisy Duck pilots "Aqua Daisy" which forms the left arm to Donald's right. 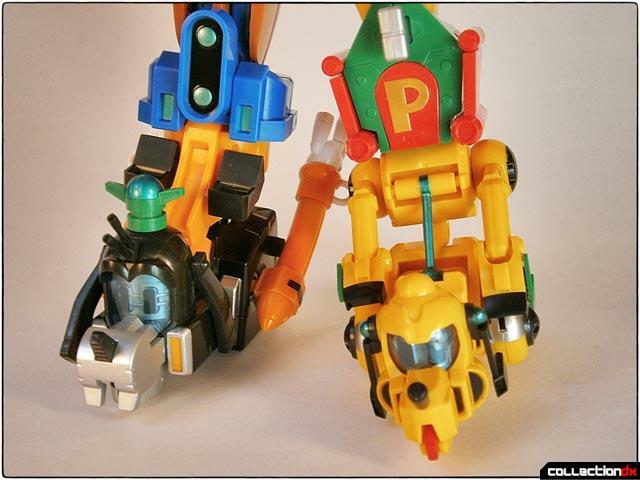 The figures are highly similar, with identical transformations and articulation, though there appears to be very little in the way of shared parts. Aqua Daisy features white, pink, and lavender plastic, highlighted in silver, gold, orange, green, and black. The torso is again made of nice hefty metal. Daisy's bow helps tie up her feathers in a short pony tail. She seems to have twin turbines on her head, perhaps for underwater travel. Daisy and Donald feature identical articulation. 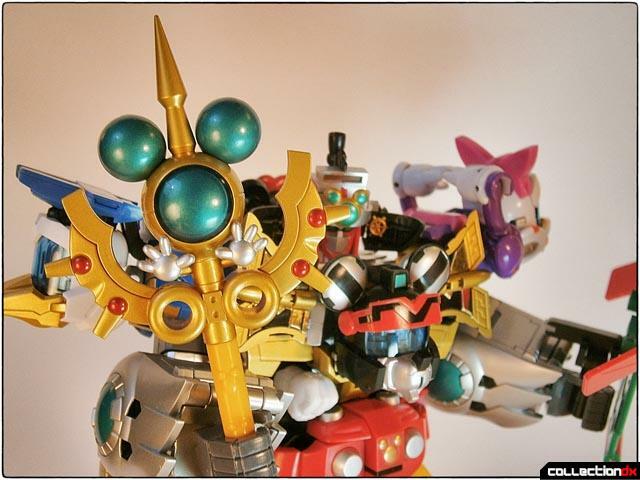 As the left arm, Aqua Daisy is ready to help shoulder whatever burdens Kingrobot Mickey must bear. Minny Mouse comes next, driving "Sky Minnie." 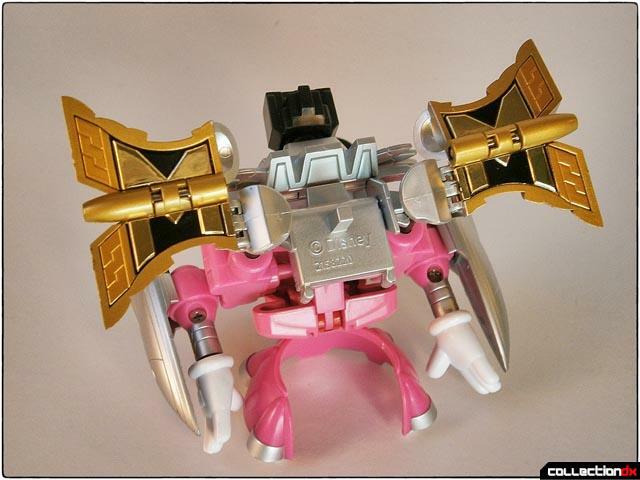 She's mostly pink and black plastic, with silver and gold highlights. The heart on her forehead is red plastic with the smaller pink heart painted in. The rocket booster pods attached to her arms are removable. Like the others, Minnie sports wonderful details, such as the bolts on the ears and her vent-like mouth. A small section of the torso is diecast. A pair of feathery wings adorn her back. The heels of her shoes are cleverly integrated with a transformation joint. 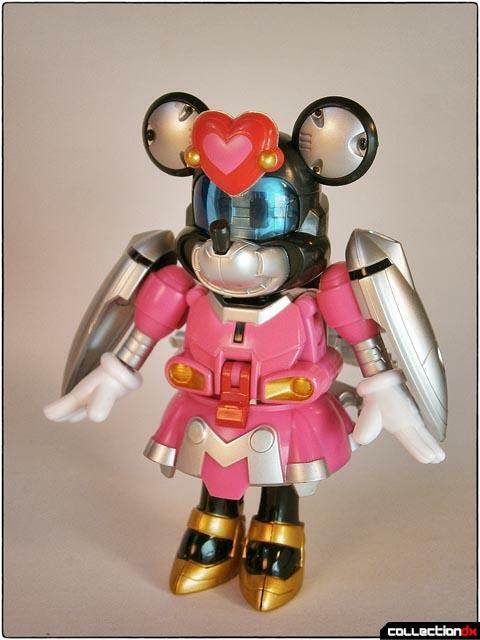 It's not immediately clear what Sky Minnie is when transformed into her component part, but she primarily forms the back of Kingrobot Mickey's torso. When combined with the others, Minnie actually faces to the rear. This section provides connection points for other parts, and faces forward. Each "M" pictured here is gold-chromed plastic. 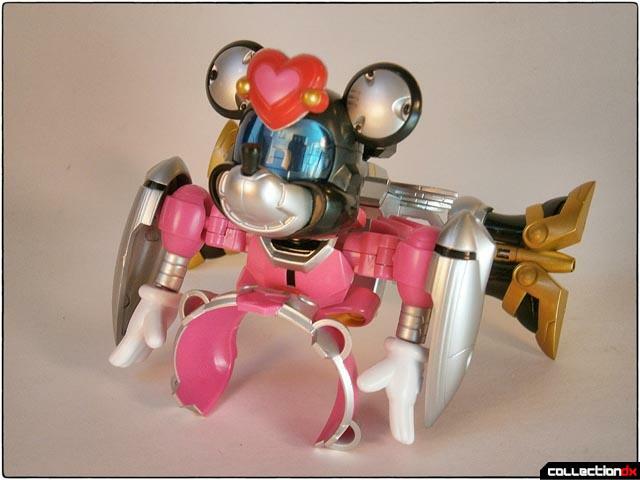 Despite the somewhat exploded look of Minnie in this mode, there is nothing that immediately feels as if it will break easily. The star of the show is, of course, Mickey Mouse. He pilots "Jet Mickey." He's rendered mostly in black, red, and white plastic, and highlighted with silver, black, green, and gold paint. The M on his chest is gold-chromed plastic. Most of his torso is glossy black-painted diecast metal. These gold wings are adjustable. Note the very small clips at Jet Mickey's elbows. These really are very small and fragile-seeming. Jet Mickey's got tremendous facial detail. There are major differences between components of Mickey and Minnie's faces, including the shape of the nose, which is boxy on Mickey and rounded on Minnie. 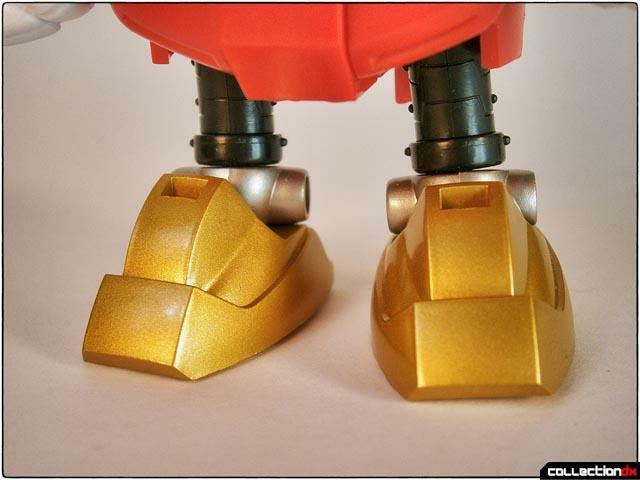 I'm quite impressed with the design of these gold-painted feet. It's just a really nice look, and Bandai's paint applications are so very consistent! There are no swirls or oddities present. 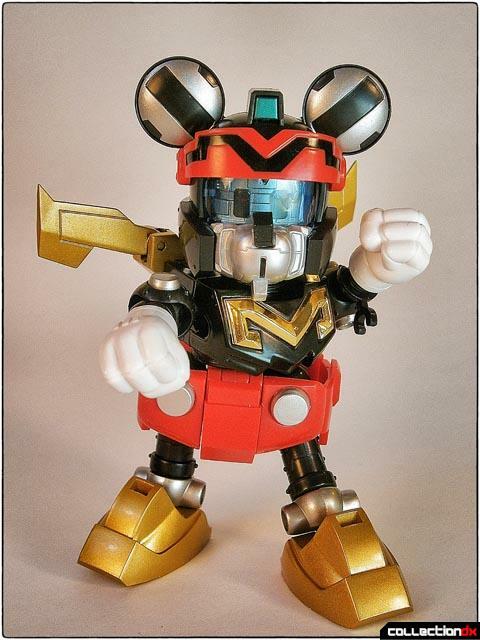 Jet Mickey features a bit more articulation than the others, so you can get a decent action pose out of him. And now, here's that special feature I mentioned before. 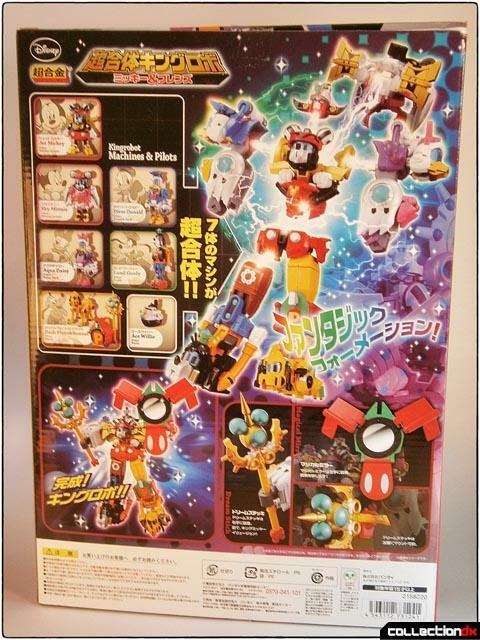 Each of these figures includes an alternate visor view of the individual character piloting their robot! 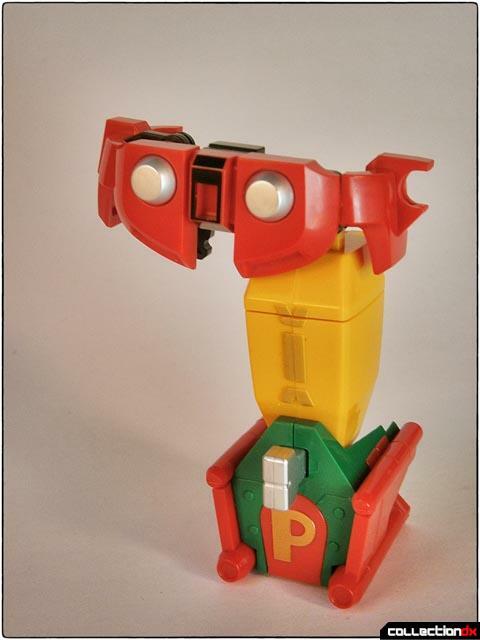 A slider on the back of the head rotates a sort of drum inside the head that pivots to reveal either the standard robot eyes, or a miniature version of the pilot peering out from behind the clear visor. Pretty neat! 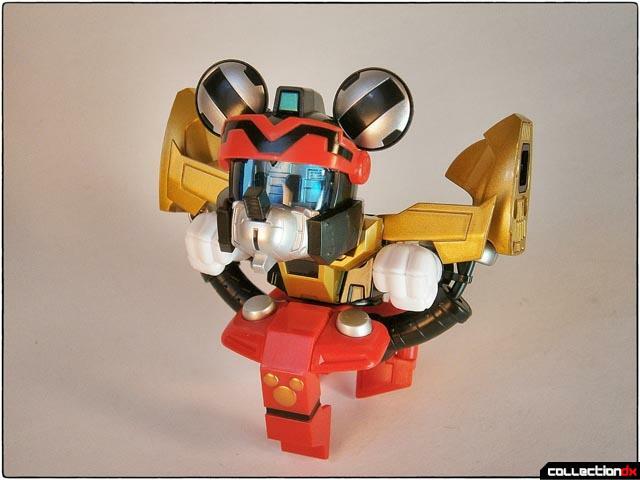 Jet Mickey's transformation into the chest of the combined robot is not particularly complex, but it does include manipulating a number of small and/or thin pieces that feel very fragile, so use caution. 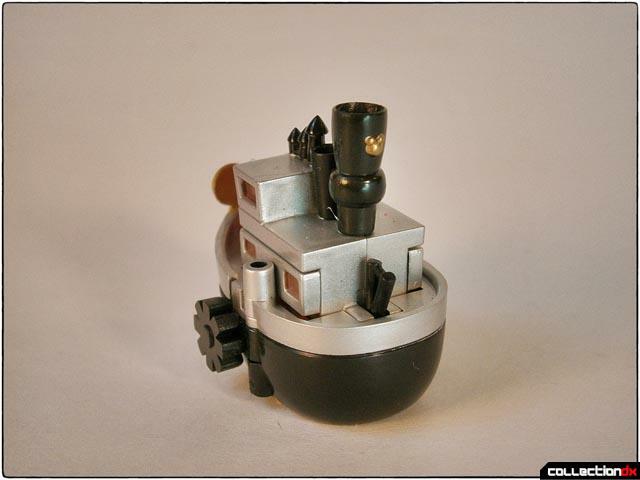 Last of all the components of Kingrobot Mickey is this very small boat from the original Steamboat Willie cartoon. 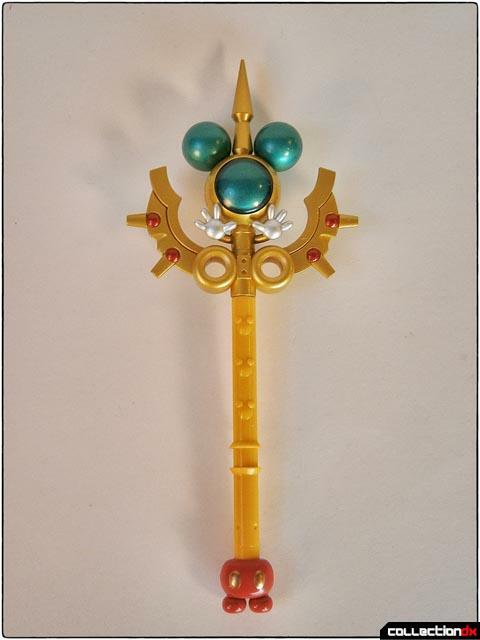 It's molded from black plastic with silver, gold, green, and brown highlights. 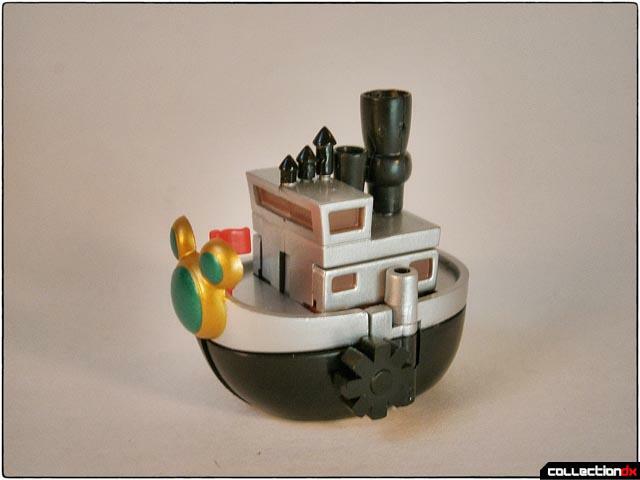 The boat is only about an inch long, but still features a lot of molded detail packed into such a small space, including paddle wheels and a tiny mouse ears logo on the smokestack. 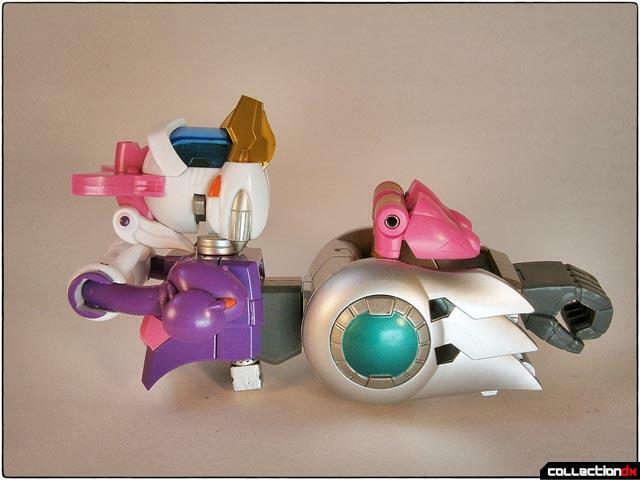 The boat splits at the bow, which allows the robot mode face to flip down. Despite the mouse ears and golden helm wheels, the face actually conveys a sense of purpose and power. 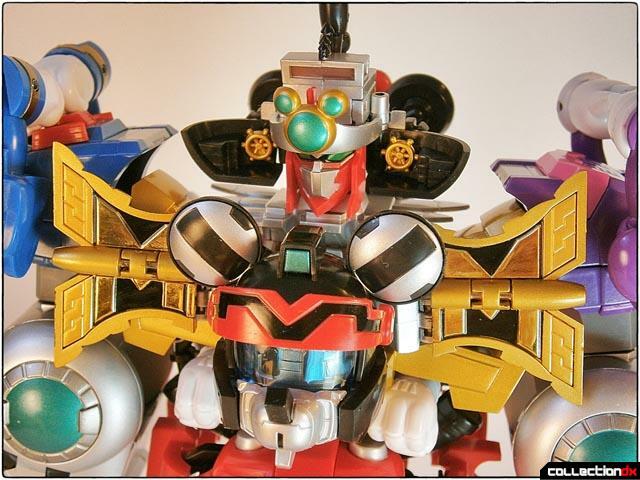 It's not unlike many Brave Series robots in its look. 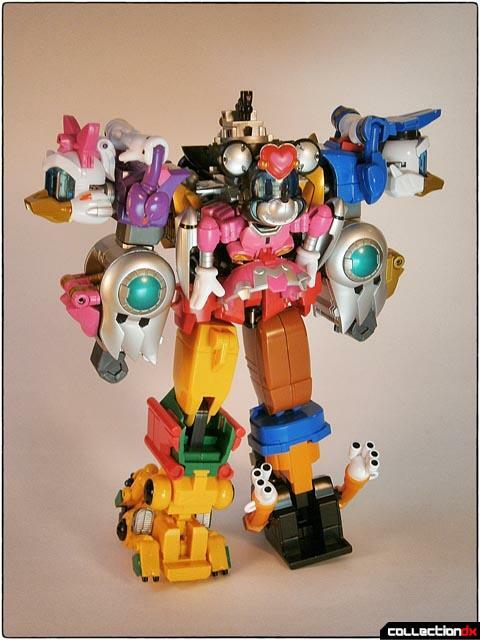 In combined mode, Kingrobot Mickey and Friends is a pretty imposing robot even though it's really just a bunch of dogs, ducks, and mice thrown together. There's a lot to look at there and yet it all hangs together. 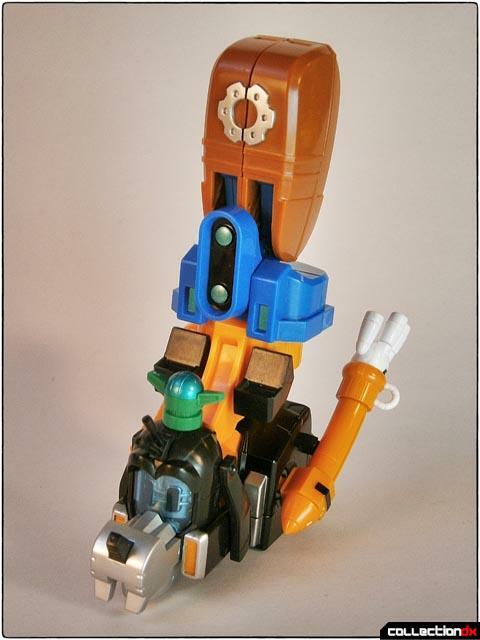 Over the years, the lion-chested robot (Daltanious, Predaking, GaoGaiGar, among others) has been a standard of Japanese toy design, but in this case a Mouse will have to fill in for a cat. Micky does a pretty good job, I'd say! An issue with the toy is that combined mode wants to lean backward. Careful display will be required to avoid possible shelf-diving. Minnie provides a lookout for anyone foolish enough to attack Kingrobot Mickey from the rear. 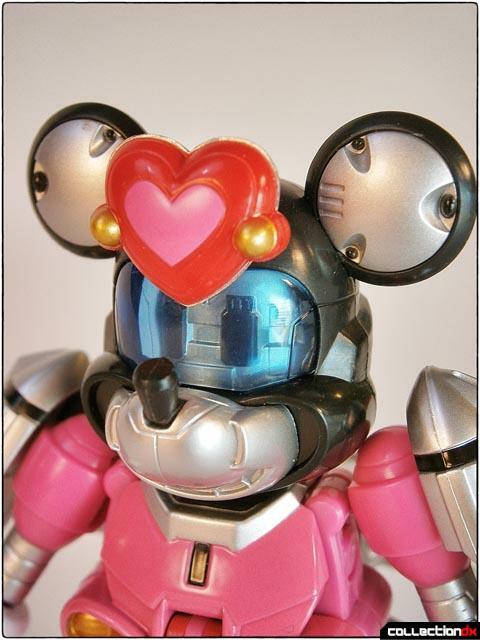 Behind every good mouse... Really, in what world would this robot engage in combat without an enemy dying of laughter? That is, until they got a gander at the steely glare emanating from this mighty cartoon war machine. After a long day of fending off his foes, I guess Kingrobot Mickey's dogs might be barking. 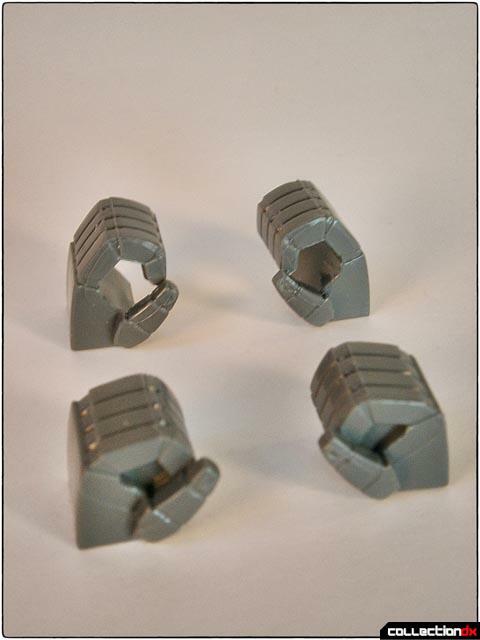 The only "option parts" that this set comes with are two pairs of hands. One molded in fists, which are the default installed on the toy. The other pair are capable of holding the Kingrobot's staff and shield. These are made of a flexible material, and can be swapped by popping them on and off a ball joint at the end of each arm. The swap is a bit fiddly, though, and is another area that feels ready for damage unless one is careful. The combined mode does have a modicum of articulation. 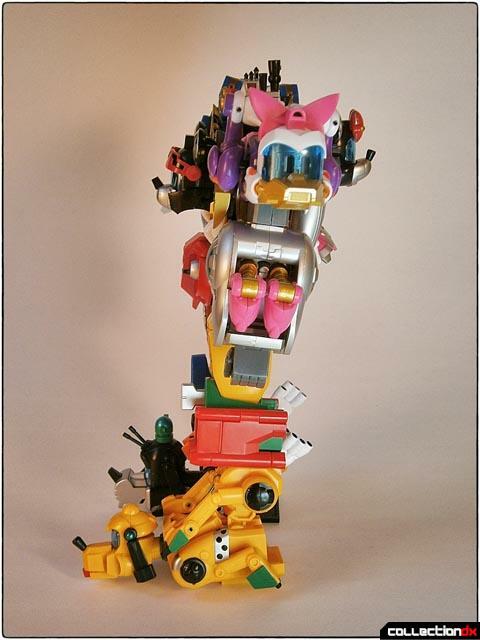 The head is on a ball joint and so can swivel side to side and look up and down slightly. The arms swivel at the shoulders up and down and out to the sides. 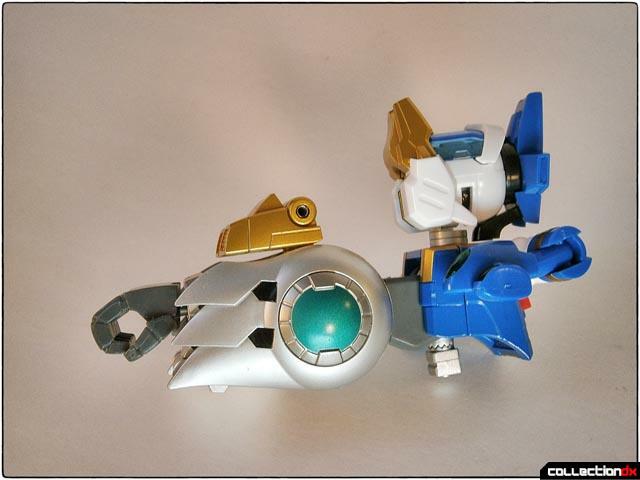 There is a bicep swivel, elbow joint, and ball joint at the wrists. Unfortunately, due to the combination, there is really no articulation from the waist down. 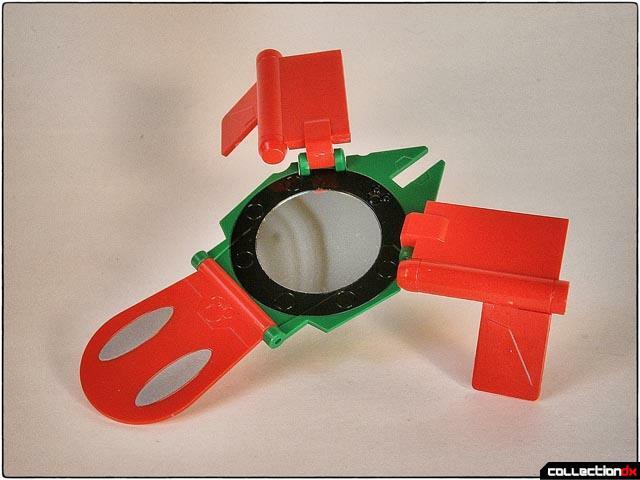 The shield's mirrored surface could be used to blind a foe as well as for defence. It really is pretty darn shiny. 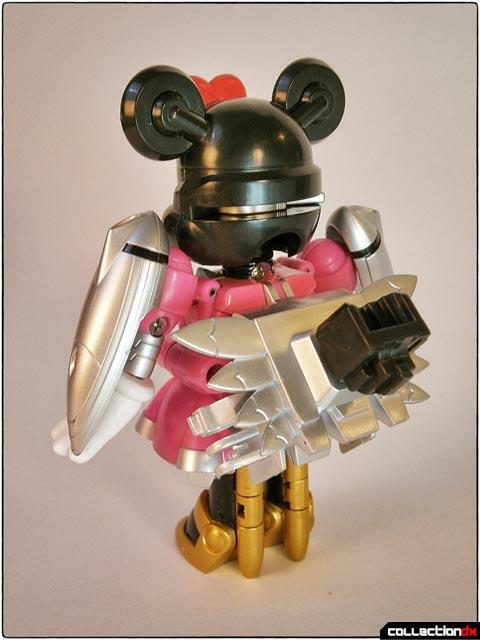 I guess as guardian of the Magic Kingdom, Kingrobot Mickey probably would have to wield a sorcerous weapon, right? What powers could be concealed in those shiny green orbs? 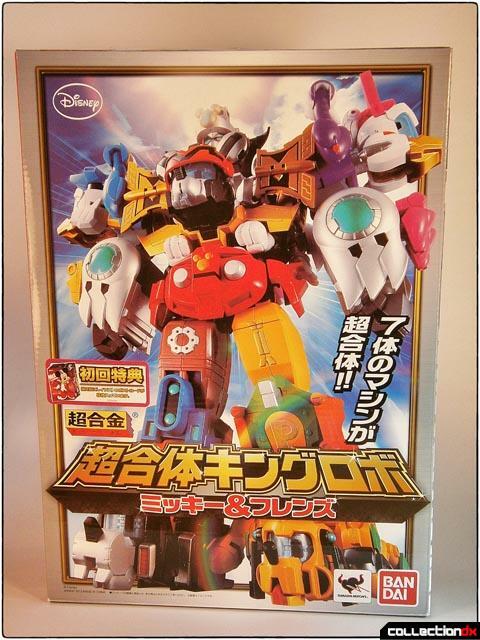 Chogokin fans usually hold on to the boxes their toys come packaged in, sometimes coveting the box art even more so than the objects within. There are plenty of bright graphics here, but it's just a photo of the toy, rather than some fantastic artist's rendition. The box is quite large, and in a nod to old-fashioned diecast robot toys, a styrofoam tray protects the various parts. 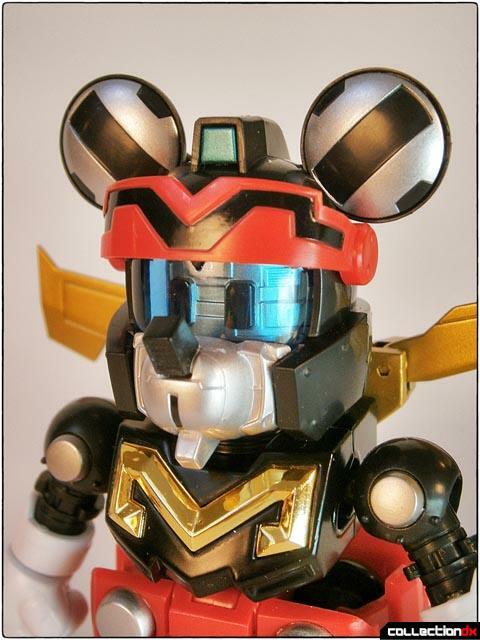 Overall, I really like the Chogattai Kindrobot Mickey and Friends toy. 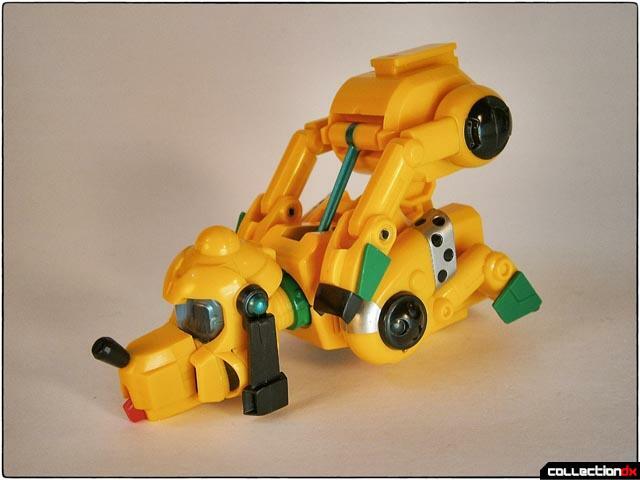 But, with the delicate parts and transformations, one really ought to refer to this as an adult collectible. I doubt this would survive more than a few minutes with an actual child handling it. At only around eight inches tall, it's a bit smaller than anticipated, but for the 13,000-ish yen price point you do get a lot of robot for the money. Any issues aside, there's a lot of fun to be had here with fantastic design work, and really eye-popping detail and color. The paint work is flawless, and the toy can look great displayed either in combined mode or as individual Disney characters. This is a one-of-a-kind weird toy, but that's just my kind of thing. As an aside, while I do some blogging on my own website, this is my first review for CollectionDX, and I thank the staff for allowing me to contribute this review. I hope you enjoyed it! This thing was engineered for my tastes. You killed it with your first review. Looking forward to more! Great review. Keep it up. Interesting item, but great review. Welcome to the CDX team! 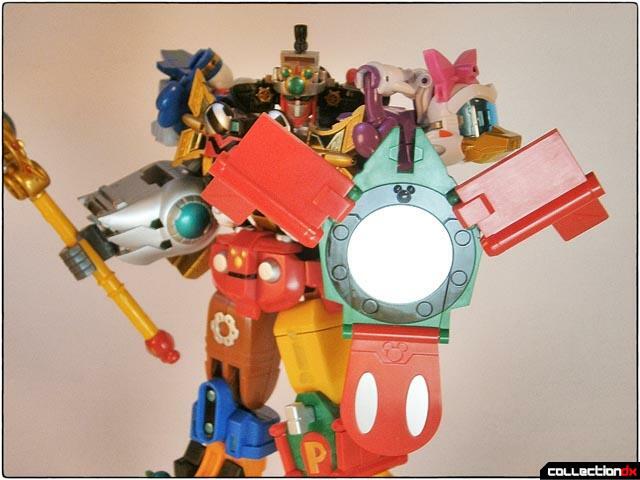 While I do love the concept of a Disney gattai, the execution is something to be desired. I just wish the designers found a way to make it less of a frankenstein creation. Thanks for the kind comments, folks! 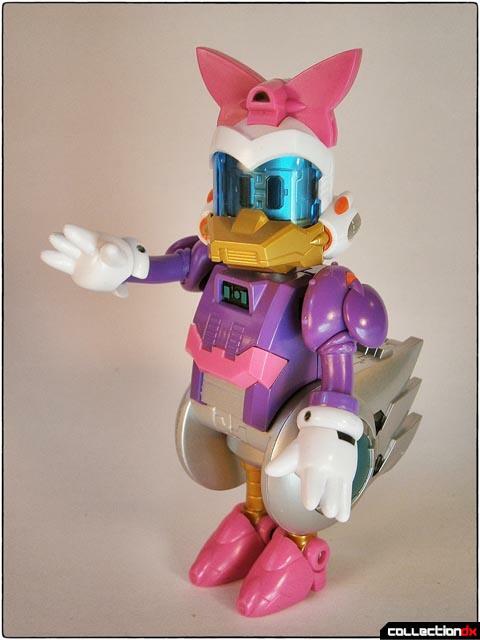 I can only hope this does well enough for a Huey/Dewey/Louie Albegas-homage robot follow-up. 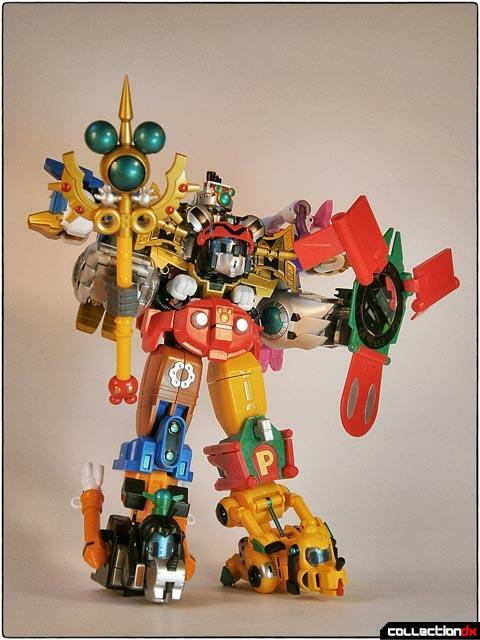 What I like of the Kingrobot is that the transformation is complex, its Dream Stick and Magical Mirror look great and the mecha is cute, the only thing that I don't like is its torso: a big mess (4 animal heads and 2 big golden pieces) but I want one, anyway. Cute! Arm connection was really loose on mine, had to add superglue to create more friction. Still not 100% perfect though. Donald's left foot also splitted in 2 during the first transformation, maybe both halves should have been glued together? It's cool to look at, but as a toy, it's not all that good. Buy on clearance, it that ever happens.